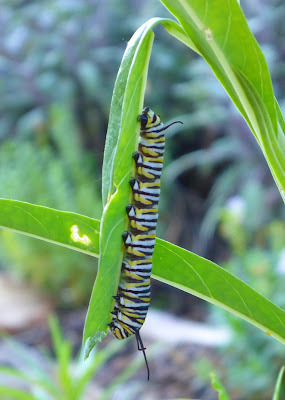 I almost started to call my weekly garden update the Wednesday Weekly Update with this post, but even though I started writing the post yesterday, obviously it didn't get finished until today which is certainly not Wednesday. 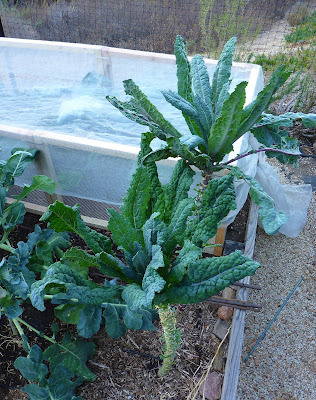 Here's a look at the well recovered Dazzling Blue Kale, so well recovered that I harvested a half pound from one plant just after the photo shoot. The other plant had funky aphid damaged leaves that were a gathering spot for aphids again so I removed those leaves and put them in the compost. It's interesting to me to note that one of the plants is more susceptible to powdery mildew and the other is more attractive to aphids. You can see one of my latest critter protection projects under way also. More on that in a future post. I'm still finding aphids in the broccoli and haven't checked the Brussels sprouts lately, but no doubt they are there. 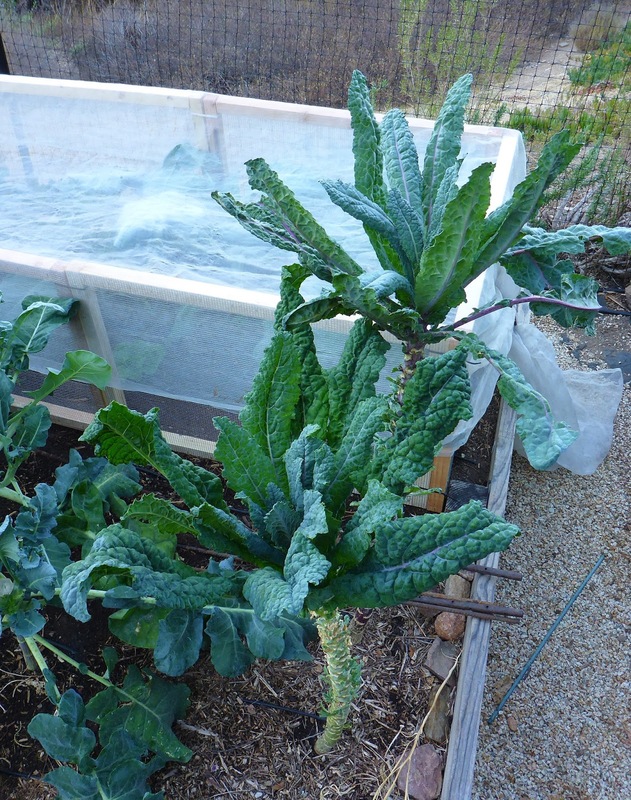 The Brussels sprouts have lost a lot of leaves in the past few days, the older ones are yellowing and dropping of. I'm not sure if it is stress from heat, not enough water, or perhaps from powdery mildew, perhaps all of the above. I gave them supplemental water during the heat wave, sprinkling it from above. The plants in the tunnel on the other side of the bed are mostly growing well. The parsnips which you can glimpse on the left side of the carrots had sparse germination and are slow to grow (as usual). The carrots performed the opposite, better than expected germination and lush growth. 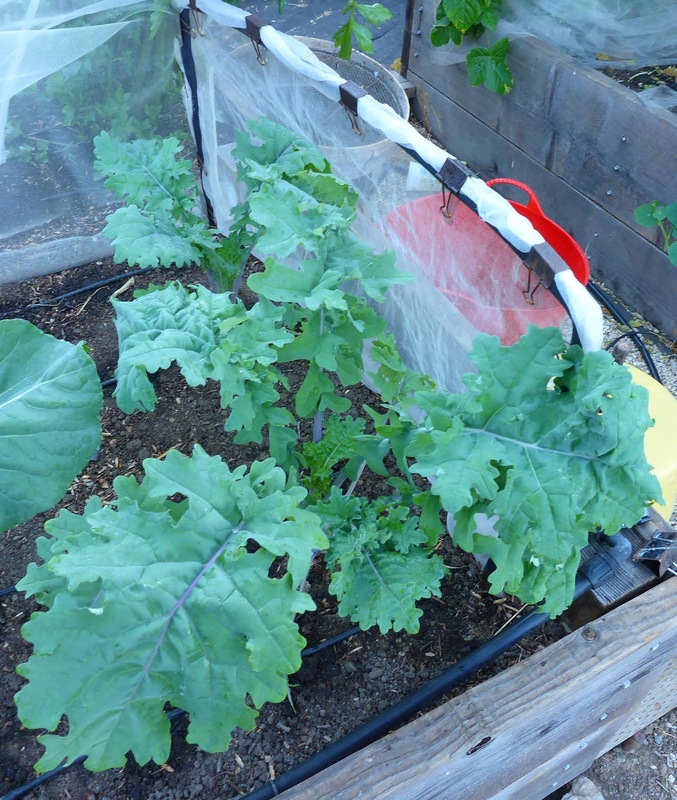 The kohlrabi has grown like crazy and is ready to start harvesting. You'll see that Kongo kohlrabi next Monday. The Tronchuda Beira cabbage and Russian Hunger Gap kales are growing well and should (fingers crossed) provide some nice harvests this fall. 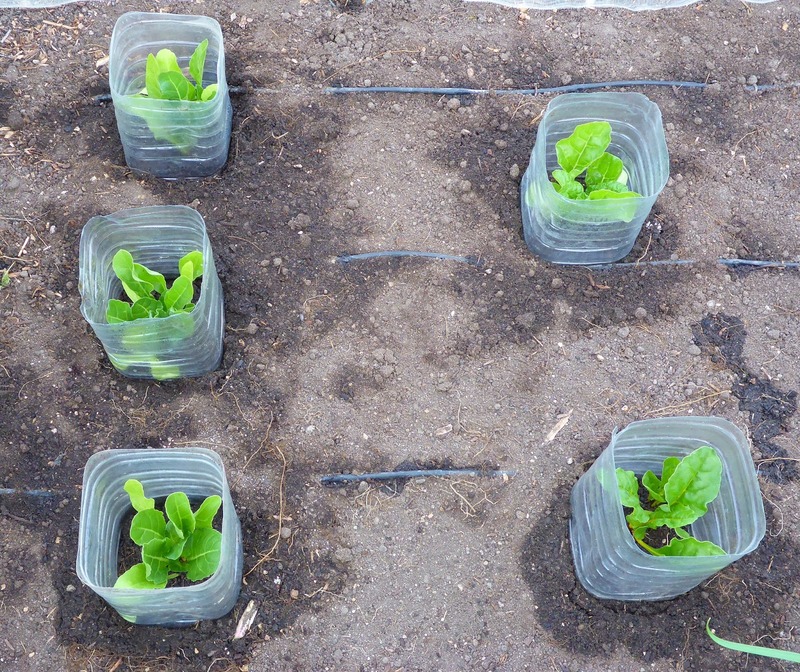 The Jericho romaine lettuce was slow to get established but seems to have settled in now. It's turning out to be a mixed year for the curcurbit family in the garden. The Romanesco zucchini has done well but has not been as crazy productive as in the past. I'm not complaining, it has produced no less than what I need. The cucumbers, not in the photo, have been disappointing, producing less than what I need. The Tromba d'Albenga squash (on the trellis behind the zucchini) have been slow to get going and are producing less than expected but I'm not left wanting. My experimental patch of Kiwano Horned melons and Vine peaches has been a total disappointment. Do you see the sowing date on the tag above? And there's the vines (2 plants) below. Not much action for 3 months in the garden. I've spotted perhaps 2 flowers on the horned melon and the Vine Peach has 2 fruits. These plants are obviously not suited to my cool climate, even though the Kiwano Horned Melon is supposed to be adapted to the Netherlands, but I guess their summer weather must be warmer than mine. Anyone want my extra seeds? They're perfectly good, just not suitable to cool summers. One Crane Melon has set. I thought the recent heat wave was going to be the start of our typical "summer in fall" season, when we usually get our longest stretch of reliably warm weather. 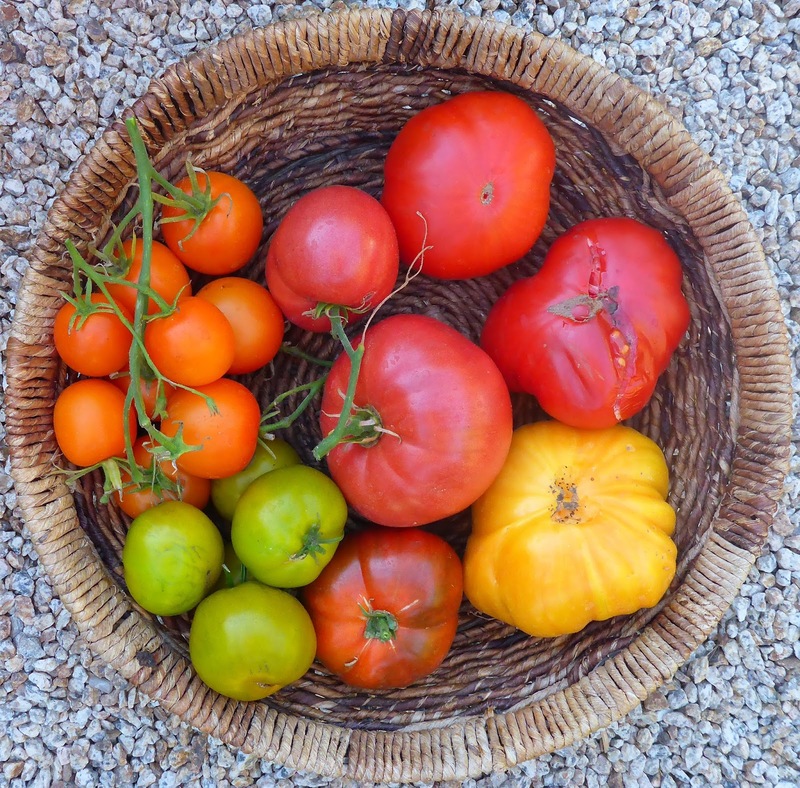 I count on that long warm fall to have success with things like melons and to extend the tomato and pepper harvests. But perhaps nature has a different idea this year, the weather is doing an about-face and it's going to get unusually cold. The next few days will see highs in the 60ºF's and lows in the 40ºF's. And this is the second cold front to come through in a couple of weeks, the first one dry and this one with a slight chance of rain. I wonder if this is a trend that will continue into or through winter. We could use the rain but too much would cause a lot of erosion and damage in the areas burned by the Soberanes fire. I don't recall seeing a sunburned winter squash in my garden before, but that's what it looks like on these Discus Buttercup squashes. I think they will be ok, the skins were hard and still seem to be so but not yet to the stage where I would harvest them. The pepper patch is still a mess and I need to go through and clear them out. I started that yesterday afternoon after doing the photo shoot. 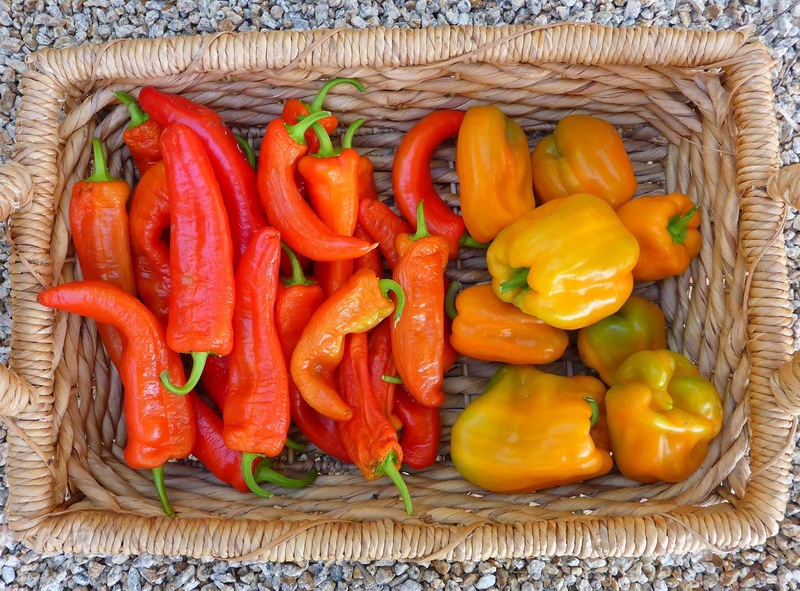 The Aji Amarillos are still the bright spot in the patch. The Baby Ajis are starting to ripen and the Grande Ajis are developing some good sized peppers. Do you see the little patches of red in the lower left background in the photo, it looks like confetti because it is pepper confetti, the rats got in and started to shred the long Turkish peppers to get at the seeds inside. There are drying Greek Gigande beans on the vines. I'm not going to get a lot of beans but I will at least have fresh seed stock to try again next year. 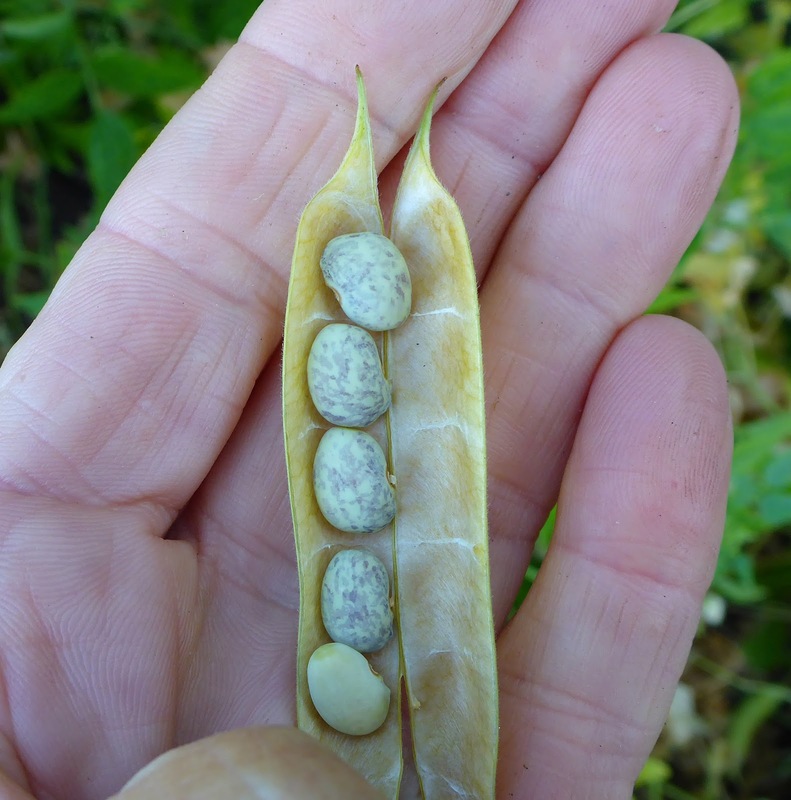 The Blue Speckled Tepary beans are starting to produce mature pods as well. They are just starting to dry, the beans in this pod were still soft. Wow, the I'itoi onions are happy! I nibbled one blade from a plant and like it. It could be a nice spicy substitute for chives. The leaves will become much larger as the plants grow. The pillaging rats continue their work. Snap traps seems to be useless. But yesterday evening I went through and wrapped each individual ear with a piece of Agribon fabric. I don't know if that will deter the rats and I'm afraid it will give the aphids a cozy spot to proliferate. But I don't know what else to try other than just ripping out all the plants. Zuni tomatillos are disappointing. I don't know if they are supposed to produce such small fruits, but this is ridiculous, that's one of the best in my hand. It has been afflicted by powdery mildew also. I'm about ready to give up and rip it out. The pole beans are trying to put out some new growth. There's a chance for a second crop if they can regrow so I'll leave them for now. To finish on a high note, one of my favorite critters is back! 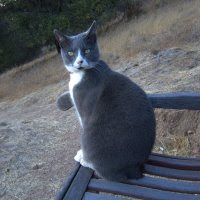 We're in the middle of a heat wave, the hottest I can recall in many weeks with temperatures exceeding 90ºF (32ºC), I guess summer has finally arrived. The heat is supposed to stick around for a couple of days and then we'll get back to more seasonal temperatures in the mid 70's later in the week. The harvests are looking decidedly summery. The peppers are not looking prime because of the powdery mildew induced defoliation of the plants. Some of the peppers got sunburned, others shriveled, a number just stopped growing and started to ripen so they are runts. 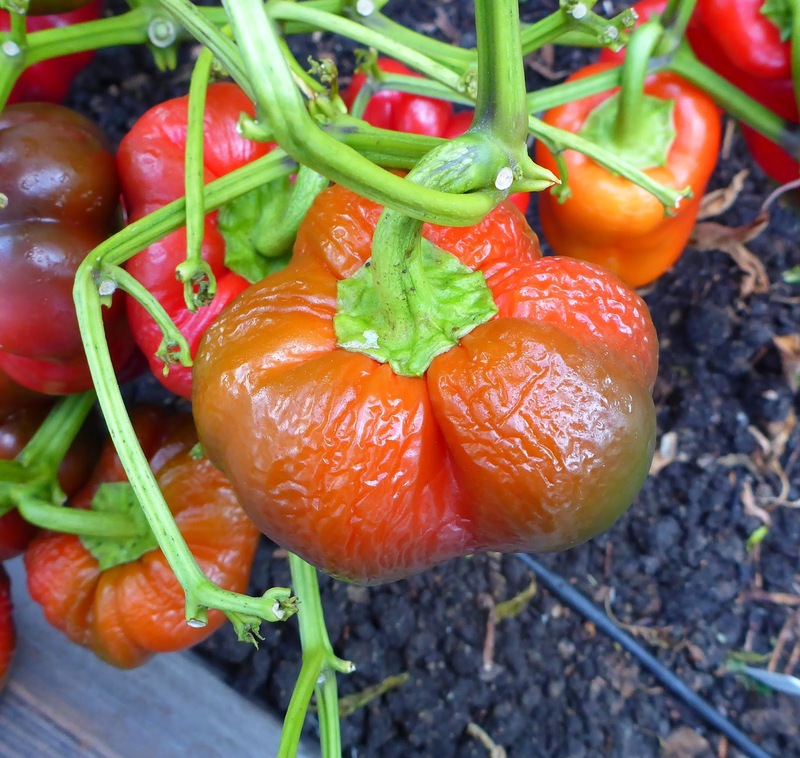 I neglected to take photos of some of the harvests, such as the best of the Lady Bell peppers. Sunday morning I fired up the Big Green Egg before the day got too hot and roasted up a number of peppers. We enjoyed some of them right away in one of Dave's favorite dishes, a Spanish Pepper Salad of strips of roasted pepper with good olive oil packed tuna and hard cooked eggs and olives scattered over the top, and the whole lot dressed with red wine vinegar and olive oil. It's a very simple and delicious salad and leftovers keep well for a couple of days. Last year I experimented with drying roasted peppers and loved them, the best way I could think of to describe them was to call them "pepper jerky" since they were chewy. So this year I'm dehydrating more of the roasted peppers, this time I've got some Etiuda, Florina, and all of the Odessa Market peppers roasted and drying. I've got a bit of a tomato glut going. There's a number of tomato based dishes that Dave and I enjoy every year when the tomatoes start to roll in. Tomato Tart with Tuna and Caramelized Onions is one of our favorites. One that we haven't enjoyed yet is Roger Verge's Sautéed Cherry Tomatoes with Basil but that is on the short list because we have loads of cherry tomatoes now. There were still some cherry tomatoes sitting around when I brought these in so I sliced the older ones and put them in the dehydrator. Saturday evening I did a quick mini tomato harvest for dinner and then some. We didn't eat all of them but a couple were damaged so those are the ones we enjoyed right away in a Caprese salad. I had to use the Orange Jazz tomato when I thought it was still a bit underripe but to my surprise I thought it was better tasting than the first one that we consumed when it was fully ripe. I've found that to be true with the Mavritanskite tomato as well. 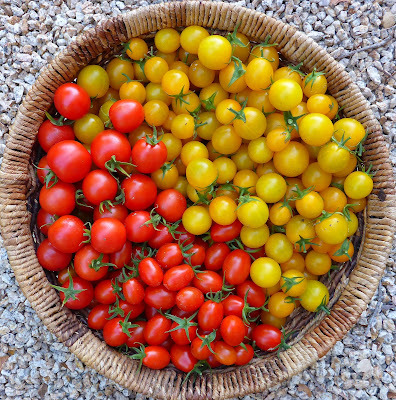 I think it may be because I like my tomatoes with a bit of acidity and when fully ripe the Orange Jazz and Mavritanskite tomatoes taste a bit flat to my palate. Sunday I went through the tomato vines and harvested the ripest ones. We had more tomatoes for lunch and dinner that day. A couple of Chianti Rose tomatoes went into a batch of Tomato Gazpacho and a mix of tomatoes went into a salad with some Yummy Belles peppers, sliced sweet Exhibition onion, and bacon. Jaune Flamme is one tomato that I like best when it is completely ripe, it is sweetest then but also retains a nice balance of acidity. Pomme d'Amour has turned out to be Pomme d'Isappointment. The plants are a magnet for powdery mildew and I don't know what other ailments. The tomatoes were late to set and slow to ripen and sparse on the vine and the ones that I've tasted so far have failed to impress. I suspect that it doesn't at all like my cooler climate. I also harvested small amounts of broccoli and a few other things that didn't get photographed, the details are at the end of the post. Oh, and I knocked one of the Discus Buttercup squash off the vine when I was inspecting it for sowbug and millipede damage. I'm going to let it sit for a week or so and then give it a try. It seemed to have a fairly tough skin so perhaps it's mature enough to have some decent sweetness and flavor. And the Soberanes fire report continues, 67 days and counting, 126,693 acres and still growing. The massive burnout operation conducted by the forest service got a bit (ha ha) out of hand last week when a dry cold front came through with some strong gusty winds. The fire pretty much raced down the Church Creek drainage towards Tassajara (along with other slop over events). There was a lot of concern about that run because there were a few historical sites in the path of the fire. Fortunately the fire fighters were able to protect them and they came through unscathed although the surrounding landscape is now thoroughly scorched. 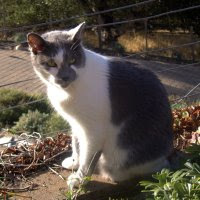 (If you are curious there are arial photos of the properties on the Los Padres National Forest facebook page - search for English Cabin. Then we got lucky and it got cloudy and damp and the wind died down and the fire stalled. So Tassajara is still standing, although the fire front is now advancing toward them from 2 directions. Rumor has it that the forest service may do a burnout operation around Tassajara to create a break. Just rumor so far. They also say that the fight is going to go direct to the fireline now instead of creating burnout areas miles from the fireline. But with a new Incident Team coming in I suppose that the game plan could totally change. Fortunately for those of us in this part of Carmel Valley the wind has been taking the smoke away from us for the past week, the southern parts of the valley are getting the Big Stink now, along with a new Evacuation Warning for some areas. Now that that's off my chest we can get back to the harvests. Calabrese broccoli - 5 oz. Green Fingers cucumbers - 7.3 oz. Mouse Melons - 4.3 oz. Etiuda peppers - 1.5 lb. Florina peppers - 2.1 lb. 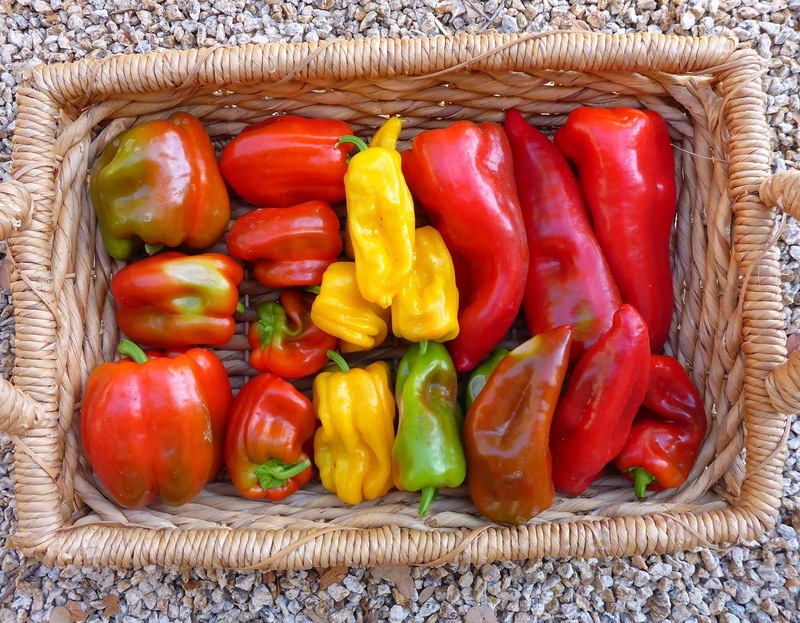 Gogosar peppers - 2 lb. Lady Bell peppers - 6.7 lb. Odessa Market peppers - 1.7 lb. 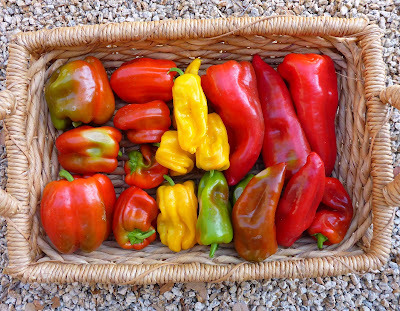 Petite Marseillais peppers - 6.8 oz. Shepherd's Ramshorn peppers - 2.2 lb. Yummy Belles peppers - 1.7 lb. Camp Joy cherry tomatoes - 1 lb. Chianti Rose tomatoes - 7.9 lb. Jaune Flamme tomatoes - 4.1 lb. Lime Green Salad tomatoes - 2.2 lb. Mavritanskite tomatoes - 2.5 lb. Orange Jazz tomatoes - 2.4 lb. 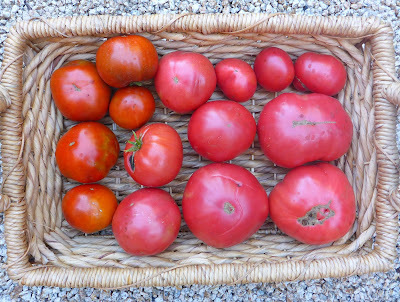 Pantano tomatoes - 5.6 lb. Piccolo Dattero cherry tomatoes - 1.7 lb. Reisetomate From Transylvania tomatoes - 3.2 lb. Sweet Gold cherry tomatoes - 4.2 lb. Discus Buttercup winter squash - 3.8 lb. Romanesco zucchini - 2.1 lb. Tormba d'Albenga squash - 2.4 lb. Happy almost Autumnal Equinox, around here it starts at 7:20 am tomorrow morning. Next week I'll have to switch from a Summer Garden label to a Fall Garden label. Another happy thing to report is a retreat of the smoke from the valley so I got to enjoy a lovely view across the valley this morning. (The view up the valley at the moment is dismaying - there's a huge plume of smoke, but at least it's not coming this way). While I was enjoying the view I snapped a couple of overview shots of the garden. This view gives a good perspective of how tall the Puhwem corn is. The beans on the right top out at 7 feet (2.1 meters) and the tip of the tassels next to the beans reach 11 feet (3.4 meters) and a number of the stalks are even taller. One thing in the garden that I'm excited about, and it's so nice to be excited rather than PO'd about something in the garden, is that the I'itoi onions that I planted a couple of weeks ago are sprouting already! What a difference it makes to plant fresh healthy bulbs as compared to the shriveled little specimens that I started with. 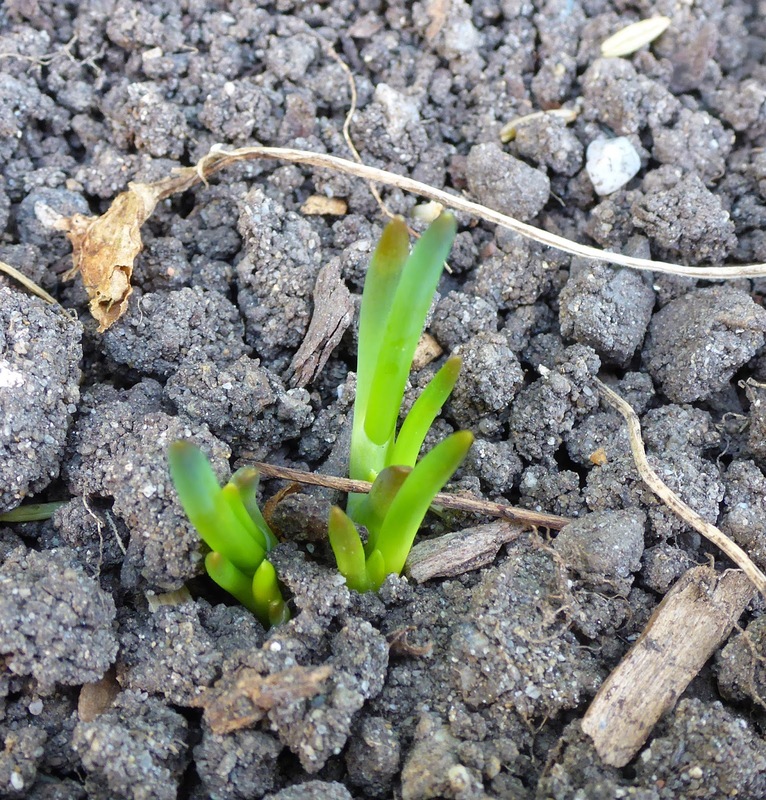 My original bulbs each pushed up one or 2 blades and very slowly started to multiply. These ones, and I started with single bulbs which must have started to multiply internally because each one has produced at least 2 clumps of blades. Oh gosh, I hope they don't become a tasty treat to some pest. 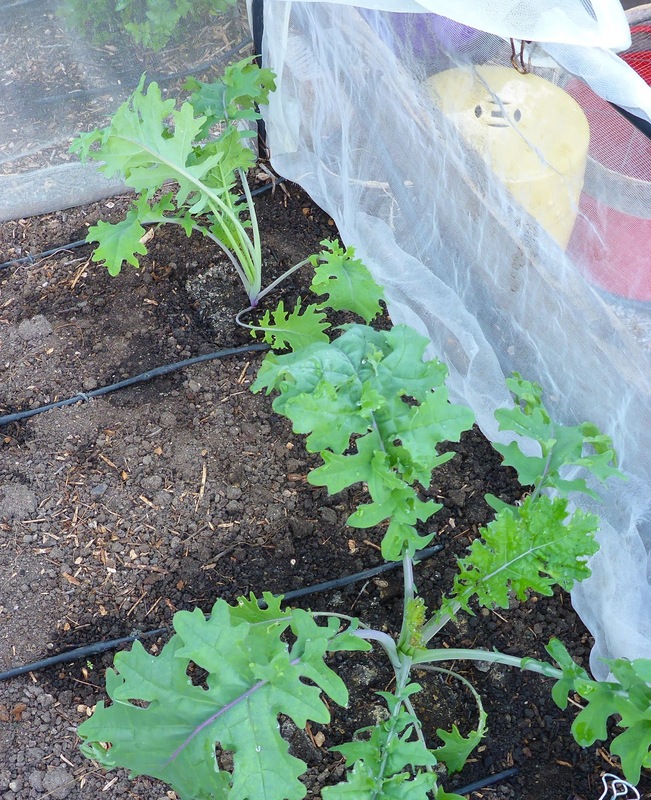 The kohlrabi is starting to fatten up. I picked up a seed packet of a kohlrabi duo from Renee's Seeds (available at the local hardware store) mainly because one of the varieties is Kolibri which seems to be popular with some of my favorite garden bloggers. Kongo was the other variety, but I haven't heard anything about it. 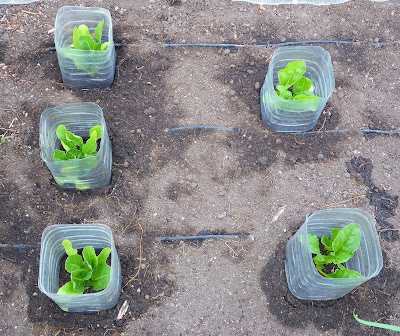 Notice that I left them to grow in the water bottle sleeves because I'm sure the rodents would LOVE to munch on those juicy stems. 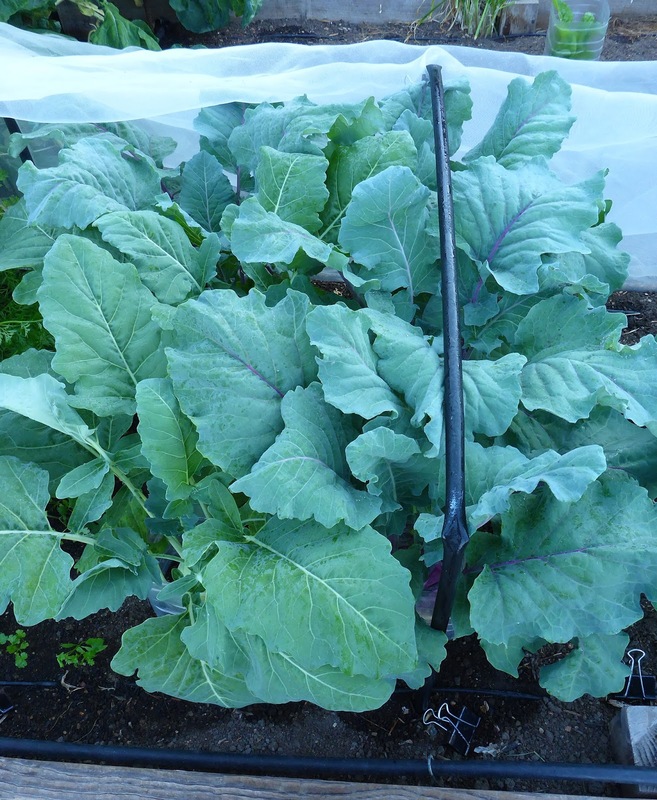 The Dazzling Blue kale is recovering nicely from the big trim and treatments for powdery mildew and aphids. I set out some chard seedlings. 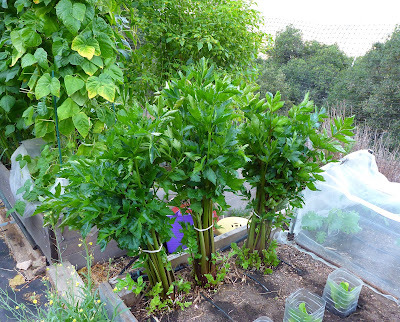 Three of Medieval Syrian since they are small plants and will bolt quickly and one each of Peppermint Stick and Golden chard. The Peppermint Stick and Golden varieties should grow through the winter and if they behave as they typically do they will get to be huge by next spring and 2 plants will be more than enough to meet my needs. That's the 3 remaining Pink Plume celery plants. I've tied them up because the outer stalks tend to flop outward. You can see how there are numerous side shoots that develop. These plants are prolific producers. It will be interesting to see if they hold off bolting this fall. I haven't figured out which melon variety this is, but a few plants have set some fruit. 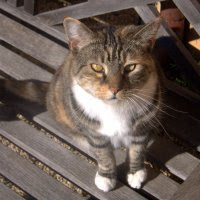 It's still questionable if they will mature enough and resist the advances of the rodents to produce anything edible. I've set the melon atop an overturned cottage cheese tub to keep the sowbugs and millipedes from eating it from the bottom up. 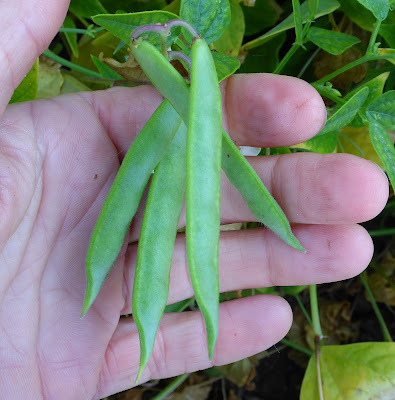 The Tepary beans have set a number of pods, but the plants are already starting to die back before the pods have gotten very full so I'm not sure if the beans will mature enough before the plants die. I haven't grown Tepary beans before, so perhaps this is normal. 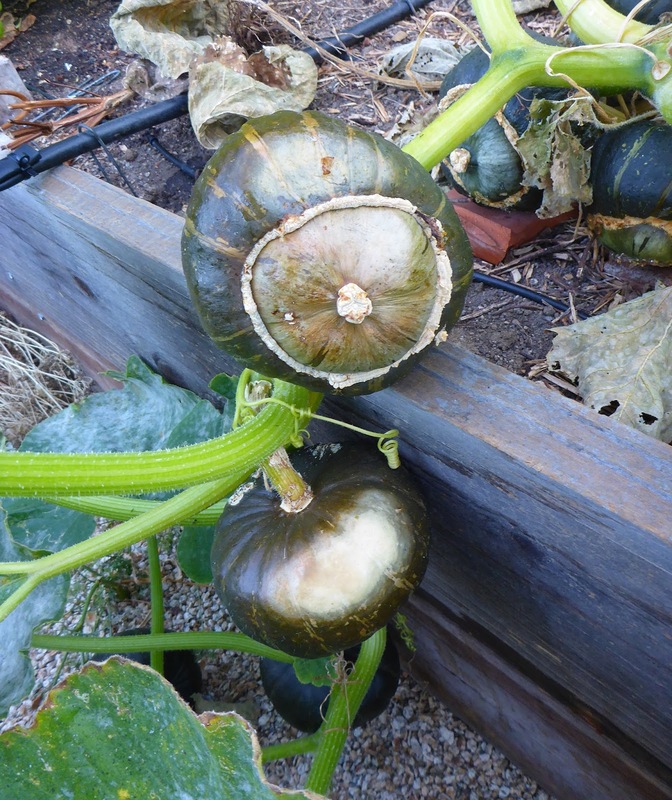 The Discus Buttercup squash are maturing. Unfortunately, yes more bad news, the squash that are sitting on the soil are being munched by sowbugs (woodlice) and little millipedes. Not all is lost though, a number of squash set that are hanging over the edge of the bed and those seem to be pretty safe although I did see signs of rodent sampling but they didn't get far, perhaps the skin was too tough for their dainty little palates. The update gets progressively more depressing from here on out. Yes, it looks like there are sprouts developing, but they are weird and worst of all they are infested with aphids. The Gustus Brussels sprouts are not as large yet and there is perhaps a chance of keeping aphids out if I start with a regular treatment program. So yesterday I mixed up a batch of Azdiractin and Pyganic and the sprouts got a thorough spraying. 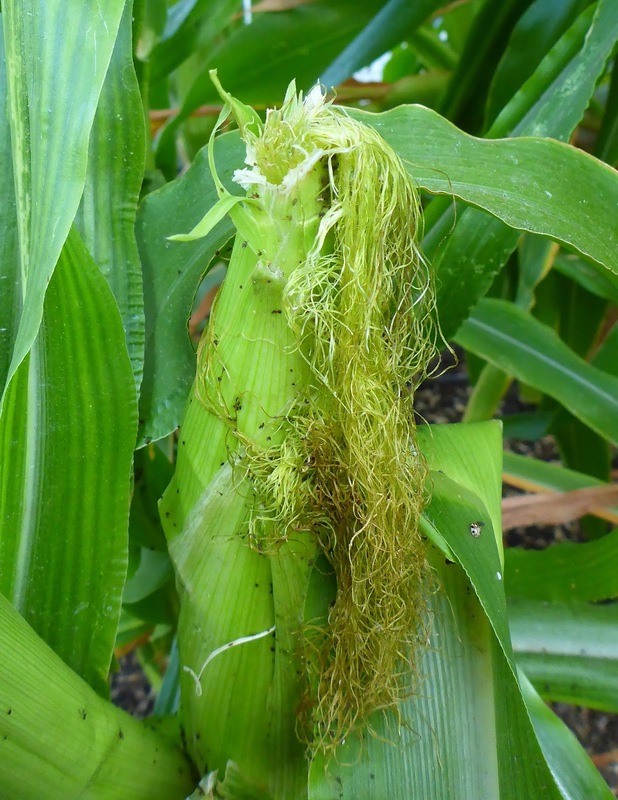 The Azdiractin doesn't kill outright, it keeps the insects from growing on to their next stage and it does has some residual effect so it will help to control the aphids that weren't killed outright by the Pyganic. Azdiractin is also effective against cabbage moth worms, a few of which I came across in the patch. That combo has been the most effective organic treatment for aphids on brassicas that I've ever tried. The eggplants are languishing. Some seem to be wilting, others have yellowing leaves that are dropping. There is perhaps some sort of fungal infection on the leaves. The pots seemed dry so perhaps they aren't getting enough water or maybe the drip lines are pinched or clogged. I gave them extra water and I'll wait to see what happens for a while, but if they don't perk up they are compost. 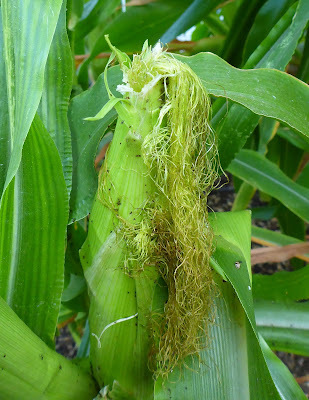 The rodents seem to have developed a fondness for corn silk. I hope this ear got pollinated before the critters started to munch. And there's aphids in there too, but they don't seem to be doing much damage, they're just creating a sticky mess. I noticed that another plant that hosted a pretty large community of aphids a while back got cleaned up by something so it's probably just a matter of time before the good bugs find their next feast here. Here comes the really nasty bits. This is what I didn't have the heart to show last week. Most of the pepper plants have been entirely or or are in the process of being defoliated by powdery mildew. Some are starting to shrivel and others are being damaged by too much sun. There's some good ripe peppers in there, but there's loads of small green peppers that will never mature properly. One of the Florina pepper plants had mostly ripe and ripening peppers which I stripped off and another plant had pretty mature peppers that had barely started to ripen. I don't know if the green ones will ripen properly, I doubt that they will be as sweet as they could be. The Turkish peppers were just starting to ripen as well. I haven't tasted them yet but I think that these may be good in their green stage. I'll have to sample some and if they are ok I'll strip the plant and enjoy them now. 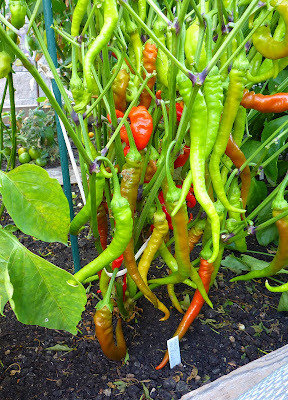 The one bright spot in the pepper patch is that the baccatum plants seem to be pretty resistant to powdery mildew. I hope so. 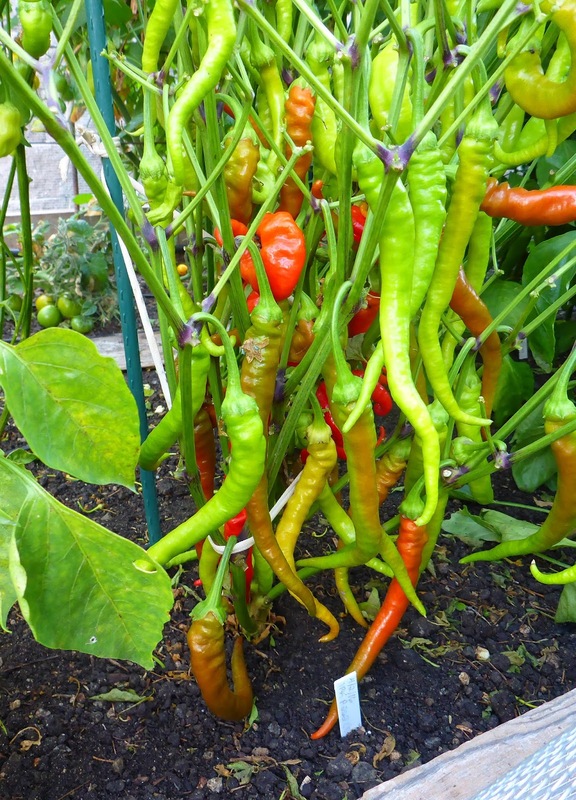 The Baby Aji Amarillo plants are loaded with green peppers and the Aji Amarillo Grande plant is just starting to set pods. And one last bad/good bit to report. A number of the tomato plants are also looking awful, the leaves are dying faster than I can pull them, but at least the fruits are holding in there for now. So there is actually one good thing that might come from the early demise of the pepper and tomato plants. I'll get to experiment with an earlier planting of fava beans. That's the latest. 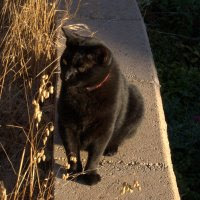 I'm hanging in there, trying to find the good things in and around my blighted garden. Not all the critters hanging about are pests. There's a huge covey of California Quail that seems to be mostly babies that are living on the hillside. They are so fun to watch and listen to. The Western Fence Lizard population is booming. I see them everywhere and there's bunches of babies skittering around as well. My favorite lizard, the California Whiptails have returned and they too are hatching babies. A pair of Mourning Doves nested somewhere nearby and the other day I got to watch a pair of awkward youngsters that I think may have recently fledged. So there's still plenty to enjoy around the garden and that's what I'm trying to focus on these days. I hope you are finding good things in and around your garden too. Happy Autumn!